European Conferences of Conference Series is glad to invite all the experts around the globe working in the arena of public health professionals, nurses and healthcare experts to the upcoming 2nd European Conference on Epidemiology & Public Health (Euro Public Health 2019) during September 16-17, 2019 at Paris, France. This Euro Public Health 2019 is based on the theme “Exploring the emerging transitions in Epidemiology and Public Health”. Conference series is hosting the 2nd European Conference on Epidemiology & Public Health (Euro Public Health 2019) at Paris, France during September 16-17, 2019. Euro Public Health 2019 Conference is based on the theme of Exploring the emerging transitions in Epidemiology and Public Health . Public Health Meeting 2019 welcomes all the Healthcare experts, Epidemiologists, and other medical & clinical experts working the arena of Epidemiology, Public health and related field to this upcoming Euro Public Health Meeting at Paris, France. Hear, learn and explore the latest research. Present before distinguished global audience. Collaborate, build partnerships and experience Europe (Paris, France). Join the global academic community. Welcome to the Euro Public Health 2019! 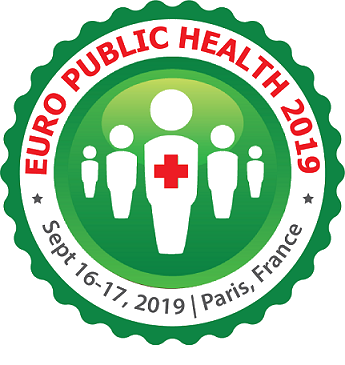 With the amalgamation of peerless speakers of Public health 2019 Conference Series LLC Ltd is privileged to announce its “2nd Euro Public Health 2019” which will be held during September 16-17, 2019 Paris, France. We cordially welcome all the eminent researchers, students and delegates to take part in this upcoming Public health congress to witness invaluable scientific discussions and contribute to the future innovations in the field of Epidemiology and Public health. Euro Public Health 2019 conference will focus on the latest and exciting innovations in all areas of Epidemiology and Public health which offers a unique opportunity for investigators across the globe to meet, network, and perceive new scientific innovations. This year’s annual congress highlights the theme,“ Exploring the emerging transitions in Epidemiology and Public Health ” which reflects the innovative progress in Epidemiology and Public health. The two days conference includes workshops, symposiums, special keynote sessions conducted by eminent and renowned speakers who excel in the field of Epidemiology and Public health which include: Nutrition and Health, Diabetes & its Complications, Obesity and Health Risks, Metabolism and Metabolic Disorders, Child and adolescent health, Chronic and Infectious Diseases, Oral & Dental Health, Mental Health and Mental Disorders, Healthcare & Hospital Management, Reproductive Medicine & Women’s Health, Cardiac Disorders & its complications, Primary and Occupational Health, Nursing and Health care, Cancer Epidemiology, Health Care Technologies and Tele-Medicine, Environment, Climate and Urban health, Public Health Policy and Administration, Health systems and economics, Veterinary Public Health, Healthcare and Alternative Medicine. This Euro Public Health 2019 invites all the Academic Scientists, Leading Epidemiologists, Surgeons, Primary Health care specialists, Pharmaceutical Industrial Delegates, talented young scientists, and student communities across the globe where all the aspects of Epidemiology, Public health. To recognize the Young Researchers and expert individuals exhibited outstanding research in Health care, Epidemiology, Public health, Nutrition and other related expertise of Public Health, Euro Public Health 2019 Conference is presenting the Young Research award through its Young Researcher Forum (YRF), Best Poster Award, and Best Presentation Award. We Welcome all to join us at this upcoming rewarding experience at Paris, where you can interact with top experts, engage yourself in a dedicated scientific networking environment, expand your knowledge and enhance your collaborative research in the field of Public Health Professionals, Health care administrators, Physicians, Doctors, Researchers, Nutritionists, epidemiologists, pharmacists, microbiologists, clinicians and researchers and many more. Euro Public Health 2019 conference brings together experts, leading researchers, scholars, scientists, professors from fields of Health care, Epidemiology, Nutrition, Physicians, Nurse practitioners and other related areas to interact and exchange ideas about the state of the art technologies related to Public health and Epidemiology. The conference will also provide an insightful understanding to the issues arising out of the Epidemiology and Public health and the future concern and remedies from that. Public Health 2019 provides an opportunity to interact with eminent Scientists, researchers, Business Leaders, experts from all over the world. The little effort put by the Euro Public Health Conference 2018 will help in taking a giant step in the field of Health care. Epidemiological reconnaissance is conducted all over to examine the etiological components of disease and causes for spreading and its preventative measures. This conference gives the international platform for recent research on the uprising and re-rising diseases, communicable diseases, Non-communicable diseases. This conference has the extent to be the source of the medical specialty variables like origin, spread and up to date status of different diseases and disorders causing deaths in several nations. Public health and Epidemiology Research mainly center on the health of the public in collective. It addresses observing and reconnaissance of nutrition grade and nutritional environments in communities or populaces at risk recognizes and investigates behavioral, sociocultural, monetary, political, and ecological determinants of nutrition-related community health. The fundamental goal of public health is the biologic, physical and psychological well-being of the general public by prolonging existence and advancing a healthy standard of living. It incorporates pre-planning of natural and man-made calamities. Numerous health systems around the world integrate public health activities and obligations in a different way, depending on the arrangement, financing, and accessibility of healthcare in population. The main purpose is catching up through decades of health economics and outcomes research (HEOR) experience broadcasting the significance of real-world insights in healthcare determination. HEOR is decisive in taking innovative treatments from the lab to the commercial center. Combining scientific techniques, deep therapy subject information and a practical understanding of the marketplace. Health economists measure multiple types of monetary information: expenses, charges, and expenditures as externalities evolve frequently while taking into consideration health and health care, especially in the context of infectious disease. The worldwide Pharmacoepidemiology and clinical research market has been evaluated to reach USD 14.2 billion in 2016-2017 and is proposed to reach around USD 22 billion by the year 2021, rising at a CAGR (compounded annual growth rate) of 7.5%, throughout the estimated period 2016 to 2021. The clinical investigation includes the Clinical examination as an element of clinical research that follows a controlled convention. Clinical research is basically performed to assess the safety and efficiency of the newly developed sedate. Clinical test data is obligatory for additional endorsement of the drug and to bring it into the market.